He is flawed, and many of his flaws persist throughout his life. He can be petty and petulant. Nonetheless, he is a hero. 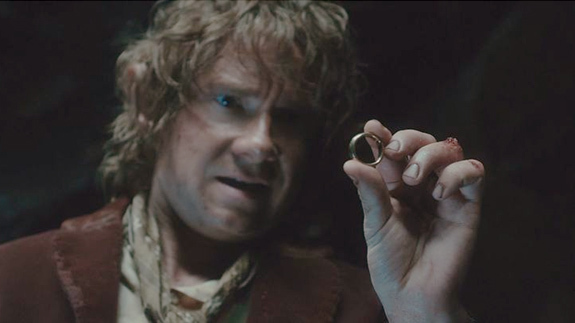 If we desire a literary hero, Bilbo Baggins wouldn’t be at the top of the list. Even those who opt for a hobbit hero would likely gravitate to Frodo, or maybe Sam Gamgee, and many “Lord of The Rings” devotees would select Aragorn, Gandalf, Eowyn, or Faramir. Harper Lee’s Atticus Finch would be on many lists, as would Jane Austen’s Elizabeth Bennet. Those seeking a hero needing redemption might go for Dickens’ Sydney Carton or Raymond Chandler’s “slumming angel”, Phillip Marlowe. In the film genre, how about Luke Skywalker or Mrs. Miniver? And in the non-human hero realm, maybe E. B. White’s spider Charlotte or Richard Adams rabbit Hazel? I’m proposing Bilbo as a most worthy hero. Most would say that Bilbo is okay as heroes go, but we can do better. Bilbo is flawed, and many of his flaws persist throughout his life. He can be petty and petulant. He was under the sway of Sauron’s Ring for many years, though never consumed by it. Aside from Bilbo’s flaws, who wants a comedic, big-footed hero? Nonetheless, Bilbo is a hero. He takes the Arkenstone from the dwarf king Thorin when he knows it will put him in great peril, because he judges this is the necessary thing to do, and there are many other examples in “The Hobbit”, the rescue of the dwarves from the spiders among them. Still, after holding the Ring for sixty years he does something the Numenorean Isildur, Smeagol, and even Frodo couldn’t do. He does something Gandalf, Aragorn, and Galadriel are convinced they could not do. He’s responsible. Though readers see Bilbo in the context of his adventures with the dwarves and the War of The Ring, he spends the great majority of his life doing what comes naturally to hobbits. He’s adventurous, something that goes against a hobbit’s nature, “mad Baggins” in the view of Rory Brandybuck and many other hobbits. Bilbo forces himself out of his comfort zone. He decides to join the dwarves after the raucous dinner party and after they’d left Bag End, when the easy and natural decision is to leave well enough alone. He’s creative: a writer, singer of songs, and poet, and he’s intensely interested in the heroic-tragic sagas of elves and men. He lives simply and without ostentation, in harmony with nature, even after he’s acquired great wealth. He doesn’t attempt to control nature, as do Sandyman and Sharky/Saruman, or use his wealth to raise himself above his fellow hobbits. He’s able to overcome the tribalism that dwells in all of us, making fast friends with dwarves, elves, and men, and choosing to live his later years with an alien race. How remarkable is this quality in our modern world where tribalism in all its manifestations is a daily scourge? Would that every hero had such a modest view of heroism.